It was reported that a 76-year-old former teacher was in tears when she spoke at a CPF dialogue session organised by MP Hri Kumar at Thompson Community Centre yesterday (14 Jun) [Link]. The elderly lady was clearly in distress. She said that she was a teacher prior to retirement. She is single and does not have any dependents. She begged that her CPF money be returned to her as she wants to use her money to settle a few matters while she still can. “What I want is my money back and I want to arrange for my funeral and I want to arrange for my rice and I want to arrange for a nice settlement. Can I have it?” she asked. At the end of her speech, a lady in a white cheongsum was seen gesturing with her hands (at the 5:33 minute mark of the video). The cheongsum lady was seen twirling her fingers in the air around her head. “She has this ‘not my problem, get her to stop talking’ attitude. Reminds me of the ‘get out of my uncaring face’ attitude of Wee Shu Ming, the daughter of ex-PAP MP Wee Siew Kim, who made the insensitive remark against the heartlanders,” the reader added. 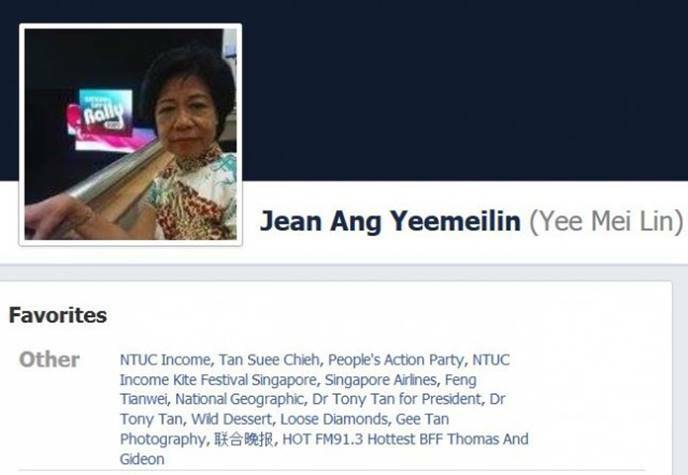 From various sources, including CSI work by netizens, the cheongsam lady has been identified as Jean Ang Yee Mei Lin. 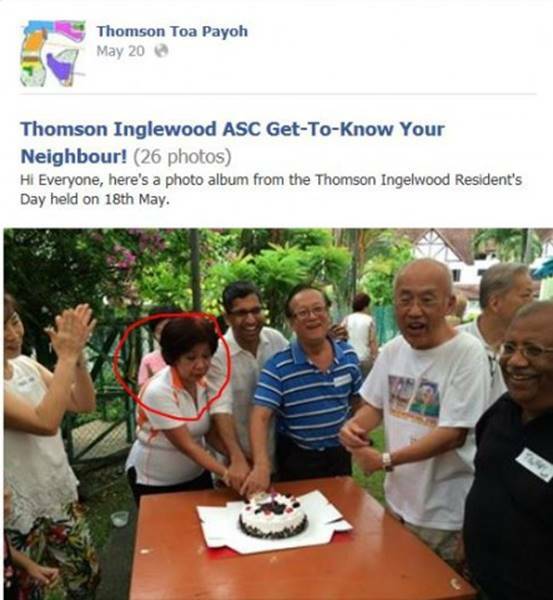 Indeed, she is a known grassroots leader in the Thomson-Inglewood private estate, part of the Thomson-Toa Payoh ward led by MP Hri Kumar. His ward is, of course, part of Bishan-Toa Payoh GRC. Ms Ang works in NTUC Income as a financial consultant [Link]. “Mocking an old lady is really unbecoming of a grassroots leader. A total disgrace!” he added. The elderly auntie’s woes is real feedback from the ground and they just tried to brush her off with lame reasons. Can they really blame the citizens for thinking that PAP does not listen? The retiree who worked hard all her life and trusted the government to guard her retirement fund, now just wants her money back to retire comfortably and without worries. Yet, the ones she voted for and trusted, have shifted the CPF goalpost… she has the right to be angry! Can the PAP blame us when we want to revamp the system and to vote in more oppositions to correct the wrong and to take back what is rightfully ours?